Its no doubt that Instagram is one of the most popular Social Networking platforms. As Social Networking sites have a big impact on our life, people always try to find ways to bypass logins to sort out some of their life problems. I was too! 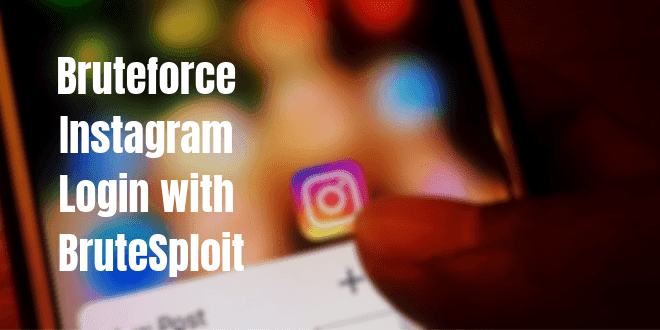 I am not asking you why you want to hack Instagram login but I will help you with a tool called BruteSploit. It is an amazing tool if you like to give time to brute-forcing. This tool is made for Pentesters to use during a penetration test to enumerate and to use in CTF for combine, manipulation, permutation and transform words or text files. But it can be used in bad ways. I don't recommend you to hurt someone but you can practice it for better security. Let's see how we can configure it in Kali Linux. Fire up your Kali Linux Machine, change the directory to Desktop and download Brutesploit from Github. Congrats! The script is successfully launched. Now its time to initiate the attack. Give the 'help' command to see the commands we can use. To see the modules we can use, I will give the command- show modules. To select a module from the list, use the numbers given against the modules. For example, I want to use the no. 5 module and I will give the command- use 0e. Now list the modules contained by the number 5 option by the command- list 0e. Here we got the list. The 4th option has the feature to brute force Instagram login. I will take this option in use by the command- use 0e4. Now in the final step, we need to set up the username, password list, proxy, and thread. You can download a password list from the web or read how you can create a super targeted password list with dymerge. And download a Proxy list also from Github. 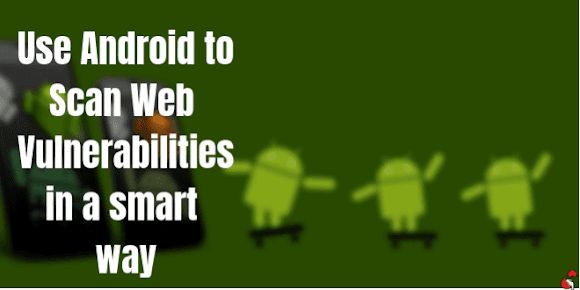 You will find many Proxy lists for free on the web. Change the path of the wordlist and proxy with yours. Now you are all set. To see whether you've configured the paths successfully or not, check it by the command- show options and in the value section, you will see the details set by you. Now run the script by the command- run. It will try the passwords one by one. If it matches, it will show the matched password with a message 'Brute completed!'. It takes time depending on your PC. If you have a high-end PC, the cracking process will be very fast. 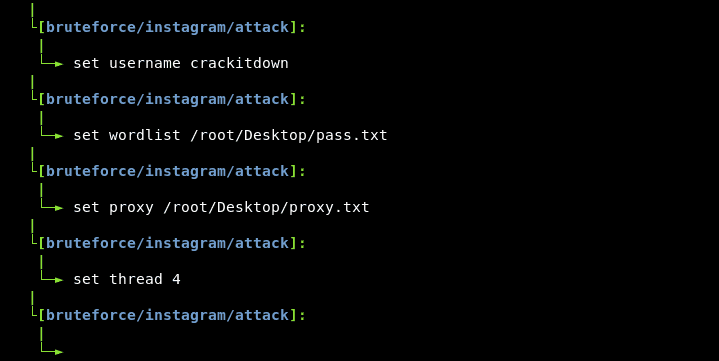 Note: You must change your IPs time to time because the Instagram authority blacklist IPs if they attempt too many logins. Bruteforcing is fully dependent on how you create the password list. In this case, information gathering takes place. Creating a super targeted password list is not an easy process. Many hackers take time for months to create a successful password list depending on the victim's interest. By the way. I loved Brutesploit. It is very easy to use and a simple tool. We must give thanks to the Author of the tool, Screetsec. What's your opinion about this tool and how you're gonna use the tool? leave a comment below and let other's know. Don't forget to leave a comment below. We offer guest commenting. You don't need to sign up for an account. The tutorial you found on this website is only for educational purpose. Misuse of these information can lead you to jail or punishment. Anything you damage, we are not responsible for that. Do use it on your own property. If you want to test it on other's property, take written permission from them. Thanks for visiting us. Please Do comment with a valid name. Don't comment as Unknown. What Is Anonsurf?| Anonymize The System Completely While Hacking In Kali Linux.